In two days – October 7, 2010 – Jersey City, NJ will see its fifth Grove Street Oktoberfest. Come down and watch the exciting two-block parade, and then stay for the great block party afterward! The festival will be complete with a traditional biergarten (beer garden), Oompah bands, and German food. Stop by “Bar Majestic” for authentic German cuisine, as well as seasonal beers. The menu will include wurst, schnitzel, red cabbage and sauerkraut, and potatoes. The event is free of charge, while food and beverages can be purchased at the event. 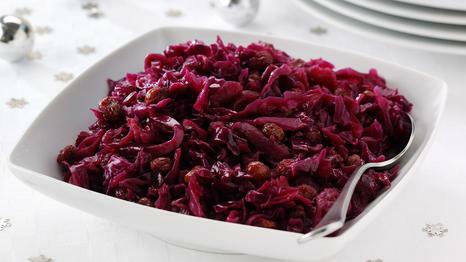 Rotkohl is a staple in Germany. While there are good German red cabbage products at places like ShopRite, making it from scratch can be very satisfying. Here is a great recipe that will remind you of Oma’s home cooking. Preparation Time: 1 hour 30 minute. This is a festive holiday drink, made to serve family and friends to celebrate Christmas and New Years (Silvester). You may also substitute the wine with a non-alcoholic version. Whisk the sugar into the eggs (or egg yolks) and add a little cold red wine, and then beat vigorously. Add the vanilla sugar, mixing in thoroughly. Add the remainder of the red wine and heat with some cinnamon, cloves, and lemon juice. Just before it comes to a boil, remove the pot from the heat. Strain and let cool a bit. A typical cake served for German coffee time. It is best to use a special pan, that when flipped, leaves a recess in the cake, much like shortcake cups, but any 11″ pan should work. Portions: 4 – 6. 12 pieces. A yummy, basic, rum cake recipe. This is especially good as a cold weather dessert. Serve with cherries over the cake for extra yum factor. Preparation Time: 1 hour, 35 minutes. This is super easy, and a nice accompaniment to schnitzel. In Bavaria, it is referred to as Pilze in Sahnesoße. I LOVE these! There are a little bit of work, but well worth it. Try them with some sugar sprinkled on top or applesauce (my personal favorite). Yum!